Thanks to the strong passion and the warm welcome of the landlords, BB Maison De la Rua, is the best place to enjoy a pleasant stay always with privacy and hospitality. Our mission is to open our home to all those travelers who are looking for a simple and cozy place to discover all the treasures that Naples can offer. You will be received in the warmest way typical of a real Neapolitan Family. Our Home is located in Via Rua Catalana, in an ancient and fascinated quarter, surrounding by many artisan shops famous for hand made objects in plastic, metals and glass. Via Rua Catalana, is totally decorated with lights and sculptures created by many local artists , one among them, the famous Italian architect, professor and designer Riccardo Dalisi, who brings million of visitors all over the world thanks to his artworks, that you will appreciate directly from our rooms!! Centrally located, very close to Maschio Angionino and Palazzo Reale, in a comfortable location for visiting Historical Center and Lungomare. 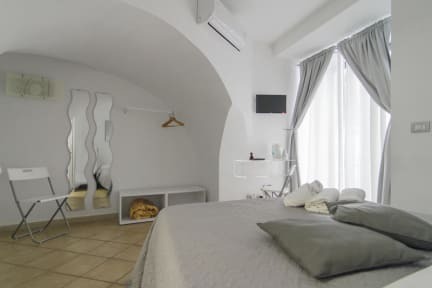 The B&B is distant only 15 minutes walking, from Central Station and Piazza Garibaldi, as well as Circumvesuviana which you can get, to reach Pompei, Ercolando and Sorrento. With Only 5 minutes walking you can reach Naples Harbor (molo Beverello) and Metro’ del Mare, where you can find many ferry-boats that bring you to Capri, Ischia and the most stunning places of the Peninsula Sorrentina and Amalfitan Coast. Breakfast is served from 8:00 0 to 9:30 in a cozy ambient sharing with all other guests. It is the typical continental breakfast with, milk, coffee, juices, cereals, toasted bread, croissants, jams and cookies, served directly by the landlord. It is also available a small but completely furnished kitchen, which you can use any time you need. In order to proceed with your reservation we require valid credit card. The remaining amount of the reservation will be preauthorized. In order to pre-authorize the credit card the property may need the CVC code. You will be contacted and have to provide this information within 1 days after your booking has been proceeded online. If the guest didn’t answer over this period, the booking may be cancelled by the property. CIty tax Euro 2 per person, per day to pay in local .